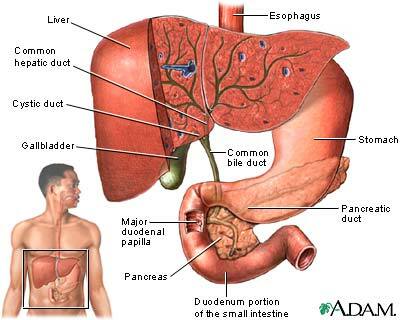 Gallbladder is the organ that absorbs inorganic bile salts and water, which later help in contracting movements to release the bile which is a digestive enzyme. This article will discuss the different gall bladder symptoms and the problems, which are responsible for their cause. Before discussing gall bladder problems it would be important to know about gallbladder biologically. It is a muscular membranous sac which concentrates and stores the bile and is present under the liver. Its shape is like a pear and is expandable. It has a capacity to hold 50 mol of fluid. The function of its inner surface is to absorb water and inorganic salts from the bile which then becomes concentrated and multiplies. It also contract to discharge bile through the bile duct into a duodenum. There are many disorders corresponding to a gallbladder and the disease leading to the problems are very dangerous and painful. These problems generally start within the body due to some common reasons like Irregular and improper dietary habits, heredity and obesity. However, there is no particular reason of their initiation. Mostly, they are caused due to minute infections or any hormonal disturbances. The root cause of a gallbladder problem is mostly a gall stone. A gallstone is basically a harder mass which is a crystalline and solid substance consisting of blood, calcium, bile and cholesterol etc.This stones are generally formed in the gall bladder from where it travels to the small intestine and starts causing problems there. The medical terminology for a gallbladder disease goes like –Cholelithiasis, which basically refers to Cholecystitis and gallstones that mean an infected gallbladder. It’s a risky disease which enhances anemia and liver problems. When gallstones block the flow of bile between the gallbladder and the small intestine it intensifies the problem leading to many severe liver problems. Jaundice occurs due to gall bladder problems. As bile is a fluid that helps in the breakdown of fatty acids but due to the presence of gallstones, there is a blockage in the way and food remains improperly fragmented. It can also reduce blood pressure and heart pumping speeds up.